A few days ago I started transferring my domains from NameCheap.com to the Domain Cost Club that I mentioned earlier on my bog, allowing me to save $169.41 per year in domain costs and that is now also available at a much lower annual fee. Yesterday I received an interesting email from NameCheap.com that I didn’t expect to receive and that reminded me of an offline way to save yourself heaps in fees for all kinds of things. And as I learned, that method also works online. In a nutshell… when I initiated the domain transfer I gave price as reason I am moving the domains and they are now trying to win me back as a customer by voluntarily lowering their annual fees. Same as with your insurances or credit cards where just mentioning to your current provider that you are shopping around for a better deal will often cause your existing provider to do the exact same for you… same way your domain registration service provider might react the exact same way for you. All you need to do is initiate a transfer to a lower cost service provider and give them price as the reason for you decision to transfer. After they lowered your prices, you can always move that domain back to your original domain service provider. So, even if you don’t plan to save by transferring your domain to the Domain Cost Club to lower your annual domain fees and in addition, have the opportunity to earn recurring commissions in their 4 x 7 forced matrix, knowing this can help you save on domain fees with your existing domain registration service provider. BTW… even though I recommend never to rely on spillover with any forced matrix based compensation plan (because I usually never receive spillover myself)… Domain Cost Club positively surprised my even in that way as the 2nd & 3rd person in my downline have actually been referred by my upline and not myself. If you are currently with GoDaddy, make sure that you at the very minimum transfer your domains to NameCheap.com or join the Domain Cost Club and transfer them right away there. If you are currently with another domain registration service provider (they are all more expensive as they don’t offer domain at-cost), join the Domain Cost Club and transfer your domains there. And if you are already with NameCheap.com and decide to not take advantage of the Domain Cost Club at-cost pricing, follow the instructions above to get NameCheap.com to lower your current pricing at least a bit. It’s not as low as the Domain Cost Club prices, but some savings are better then none at all, right? I hope this blog post helps you save a lot money every year and if you like it, please share it with others. As mentioned right here, I joined a new Domain Cost Club to save myself $169.41 per year in domain costs at a one-time cost. In 3 days the early bird registration for the Domain Cost Club ends. That means that if you also like to save the most possible on the long run… you should get yourself a lifetime Charter Membership before this Tuesday morning, September 30th for a one-time fee. Why? Because this brand new Domain Cost Club will save you cash as it allows you to get domains at-cost pricing. I registered all my domains originally with NameCheap.com… which offers new .com registration for $10.29/year ($9.66/year with a coupon code) and renewals at $10.69/year. Now, some people may think they get the coupon code pricing also for the annual renewals… but I tried that, they don’t work for renewals, renewals are always full price: $10.69/year. 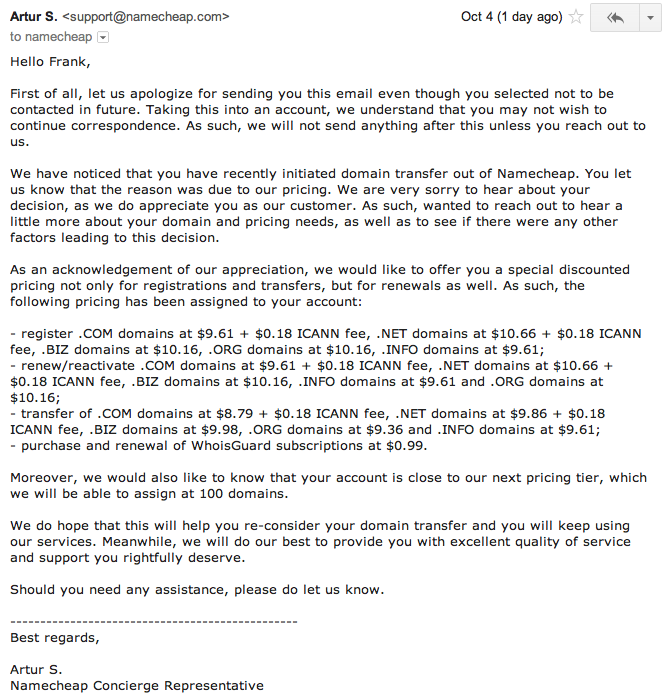 BTW… even if you choose not to save with the Domain Cost Club, make sure you at least use NameCheap.com instead. I won’t go into all the horror-stories I heard about GoDaddy, but make sure you at least transfer from them (if you still use GoDaddy) to NameCheap.com. If you like to learn more why to avoid GoDaddy, click here. I personally own currently 64 .com domains… see why a one-time fee for a lifetime Charter Membership is a no brainer for me? Besides .com’s, I will also transfer my .net’s, .ws’s and .biz domains. There are some domain extensions where Domain Cost Club is up to $40/year cheaper then other domain registration services. So far they support 178 different domain extensions. Their domain transfer system will be ready in 2-3 month, until then you can register new domains and contact their support to manually transfer your existing domains over. If all you want to do is save on domain costs… then their one-time fee lifetime Charter Membership makes sense for anybody that has at least 20 .com domains. Even after September 30th… if you prefer to get an annual account instead of the lifetime Charter Membership, it will still make sense if you have at least 40 .com domains and all you do is save on your domain expenses. But if you can also see the potential in referring others to the Domain Cost Club, then even with a single .com domain this will be huge… every person you personally refer will earn you between $25 and $200 in commissions. And for those of you that love network marketing… they have a 4×7 forced matrix (did I hear you say spillover?). The parent company has been in the domain business for 15 years now… I personally have been with them since 2004 and every month since they have always mailed me my monthly checks… like clockwork. I trust them 100% and love how they are so dedicated and focused on what they work on. Final food for thought… the parent company, Global Domains International, charges just $10/month and pays $1 in commissions on 5 levels. Still… I paid a total of $1,200 over 10 years and received from them in return not just their product, but on top also close to $25,000 is payment checks. Let’s say… I just love it and it makes me appreciate Domain Cost Club even more. Check out their latest product, Domain Cost Club and see if their lifetime Charter Membership (or after the 30th of September) their annual membership is right for you. Just did the math… this brand new Domain Club will save me $169.41 per year in domain costs by allowing me to get my domains at-cost pricing. Click here & check out how much it will save you! This is a brand new product of a US based company that I have been with since 2004 and that paid me so far $24,555.04 in commissions on their first $10 product. So, when they announced this Domain Club that saves me $169.41 per year in domain costs for a one-time fee, plus pays out between $25 and $200 in commissions per referral… joining was a no brainer. Check it out & join me! Let’s assume you have an online software product that stops key loggers. What is the best way to promote it? 1. Who is the ideal customer for my product? 2. Where can I most likely find my ideal customer? 3. How can I best get my best customers attention? When you answer that first question, beware that “everybody” is most of the times not the true answer. Let’s say in your specific case you might think that “everybody” needs protection from key loggers, right? Well, that might be (even if many Mac users will argue that they are usually not the target of key logging software that’s usually Windows based)… but, even a Windows user might “not be aware” that he has a need for that kind of protection. My point is… the ideal customers for a key logger protection software are people that are aware that there is a danger and that want protection from it! There is a way to promote key logger protection software to people that are not yet aware that they need it, but it’s not the ideal customer and it needs a different approach. More on that later. Now that you know who the ideal customer is for your product, it’s time to figure out where those customers are usually found online. Besides targeting your ideal customer straight in their email inbox (assuming you have access to a mailing list for this type of customer), where else can they be found? What you are looking for is a forum or blog that either sells advertising space (e.g. banner ads) themselves or that uses Google Adwords on their site. Even if they don’t do either of those two, but allow their visitors to post or comment with either a forum signature including a link or their linked name on blogs, you could use that to advertise on their site simply by being an active participant that provides helpful posts or comments. And of course there is also Facebook Ads that allows you to pin-point exactly who you want to advertise to and that way not just advertise to everybody, but only to your ideal customer as they use Facebook. This leads us to the 3rd question… how do you get their attention? And how can you possibly not only get the attention of the ideal customer, but also of those that are not yet aware that they are also an ideal customer? Here is an ad example: Is your online banking account in danger of getting robbed? Or: Don’t be the next identity theft victim! What is important to keep in mind when you advertise online is that the page that your ad leads to repeats what your ad said and continues from that point on to explain how your product is the solution of the visitor problem or concern. After all, you don’t want to loose your potential new customer once they arrive at your web page due to them to understanding the connection between your ad message and what your product offers. Let’s assume you have a list of about 3,000 subscribers in Aweber (or GetResponse etc. ), built with solo-ads and ad-swaps. What is the best and fastest way to scale up that won’t break your bank using your existing converting lead magnets and still get the highly targeted traffic you’ve been getting? Building your own list driving traffic to great converting squeeze (aka lead capture) page via solo-ads & ad-swaps is one of the best ways to do so. The downside with solo-ads though is that they can cost a lot of money. Ad-swaps on the other side are free, but will initially only get you small list increases as you usually can only swap ads with a list of similar size of your own. The other disadvantage of ad-swaps is of course that you are potentially watering down your list by sharing them with other list owners or reducing the effectiveness of your own mailings by having to email them with offers from other list owners as part of the ad-swap. 1. What is the cost per new subscriber? 2. Will I need to share my existing or new subscribers? 3. How much time does it take to utilize the list building method? 4. How effective is the traffic source used to drive traffic to your lead capture page? We are looking for affordable methods, but of course everybody has a different idea about what that means in terms of cost. In addition, a lot of traffic sources will not provide a clear picture of the actual cost per subscriber or effectiveness of the provided traffic… leaving only the option to test & track the results. 1. Email advertising with Viral List Mailer services that allow free or upgraded members to email their members e.g. ViralURL.com, ViralinBox.com, ViralHosts.com etc.